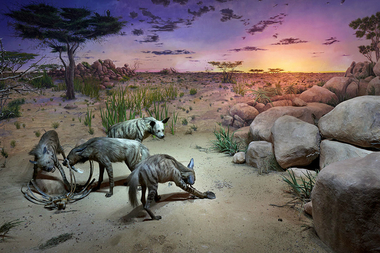 The new Hyena diorama opened Wednesday in the museum's Hall of Asian Mammals. MUSEUM CAMPUS — Like many kids, Aaron Delehanty made his first diorama in grade school, when he built a little Mohawk village out of popsicle sticks. Now he's making much bigger displays — and ones seen by thousands of people a year. For the last six years, Delehanty has been a staff artist at the Field Museum. That means he spends most of his time filling out what visitors see when they enter the Field's doors, whether that's an African habitat or a prehistoric farm. Delehanty's latest work is a display of striped hyenas that will open Wednesday in the museum's Hall of Asian Mammals. Sponsored by a $155,000 crowdfunding campaign, the mini-exhibit is the Field's first new diorama in decades. "I've been working pretty late into the night to make sure it gets done," Delehanty said. Armed with paint and clay, Delehanty was tasked with reproducing the hyenas' Somali habitat in six months. That meant sculpting his own African aloe plants, charting the accurate star pattern in a dusk sky, and rubbing a mural with beeswax to reduce the painting's glare. "Someone brings in a photo of giant elephant bird egg and asks, 'Can you make this elephant bird egg?'" said Delehanty, 38, of Irving Park. "Just to be able to engage with something like that, take their ideas and turn it into a object, it’s pretty awesome." WATCH: Videos of Delehanty explaining his work. Scaling Down: The Miniature World of Dioramas from The Field Museum on Vimeo. Though the hyena display is the latest Field diorama from Delehanty, it could also be his last. The artist, who also built dioramas for the Field's China exhibit, was moved from his full-time post to a contract job last year, and is leaving the museum March 11 when his term expires. Jaclyn Johnston, a Field spokeswoman, denied that the decision to move some of the museum's exhibitions staff, including artists, to contract work was a cost-saving move. Instead, it practically reflects how often the Field churns out new exhibits, she said. It's possible former Field artists, including Delehanty, will be contracted again for future dioramas. "If there are no active or upcoming exhibit needs for a mural painter, their term will reflect that," Johnston said in an email. Still, for Delehanty, the decision means he soon won't be able to spend his days (or the occasional night) at the museum. Instead, he will work out of his home studio. The transition will be "tough," Delehanty said, but he has no hard feelings. "It’s such an amazing place with just huge ambitions. It’s impossible to be bored here," Delehanty said of the Field. "It’s just a very intellectually stimulating environment. To be in a place where you’re constantly just impressed with the natural world is pretty special."